This is part 3 in a series on fishing rigs. The Floating Rig is an excellent rig to fish heavy cover, rocks, and brush. Learn all the parts of the Floating Rig, learn how to tie it, bait it, and how to fish with it. Tie one end of your leader line to the barrel swivel. Tie your main line to the other end of the barrel swivel. Finally, tie the loose end of your leader line to your hook. When tying your tackle to your fishing line use the Clinch Knot. 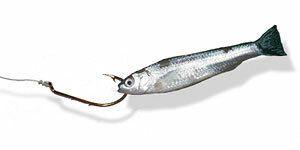 The best bait for a Floating Rig is an artificial worm or a night crawler, but I have also used a minnow. Minnows should be hooked through the back of the lips to allow the minnow to swim freely. Hook a night crawler or plastic worm exactly like a Texas Rig. Hook it through the thick part of the head about an inch down. Move the plastic worm or night crawler head all the way to the eye of the hook. Finally, hook the worm again just a little higher up the body where the barb of the hook rests against its body. Do not puncture all the way through the worm, rather hook into the body and allow the barb to rest inside the worm with the barb pointing upward. You want this rig as light as possible which why we don't use any weight. If your rig sinks right to the bottom, then your rig is too heavy. Try using a smaller hook or using a worm blower to fill the bait with air. This should increase the buoyancy of the Floating Rig. The best place to fish the Floating Rig is around rocks near dams or levees for obvious reasons--you can avoid snags. First, the rig should "float" over these hazards because it has little weight and second, because without the weight it has fewer parts to snag between rocks or over brush. Fishing the Floating Rig is slower than other rigs. You want the bait to glide over obstacles and giving the line too much of a tug would inevitably cause the hook to hang you up on rock or branch. You want to present the bait as naturally as possible which entails softer and slower tugs and reels of the line. Try being as creative as possible. Cast the rig into heavy cover of trees, branches, rocks, leaves, etc. and let the bait drop and float over these obstacles I have had more success within seconds of the bait hitting the water. Hey, thanks for the tips, man. Appreciate it.